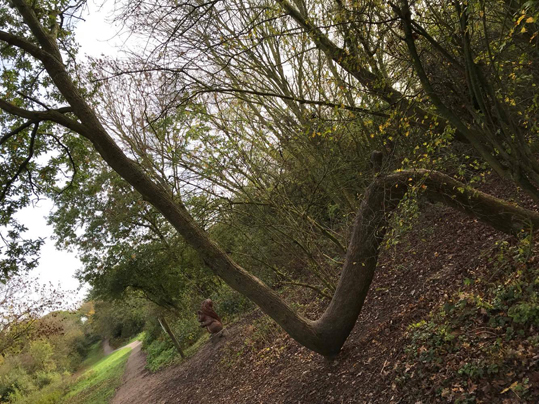 This picture of a strangely bent oak tree was sent to me by Lee Edwards and was taken on a walk with a friend in an Essex nature reserve. She said: "Found this unusual. It appears to be a trained oak on a nature reserve made out of the old Plotlands. The whole place has some interesting areas and they are working on heritage orchards and gardens." I had no idea what Plotlands were, so I asked her. She explained that Plotlands was once small plots of land sold in the early 20th century to people who built weekend cottages or ran smallholdings. Many of owners were East End Londoners who wanted an escape from the grime of the city. During the Second World War, many of these people were bombed out of their London homes and had to move to their plots permanently. Although much of this area has now been rebuilt and is part of the town of Basildon, a small area has been retained as a nature reserve and museum showing how people used to live. Presumably one of the plot owners trained this oak with the intention of later making something out of the wood. I wonder what. The photo is copyright Lee Edwards.